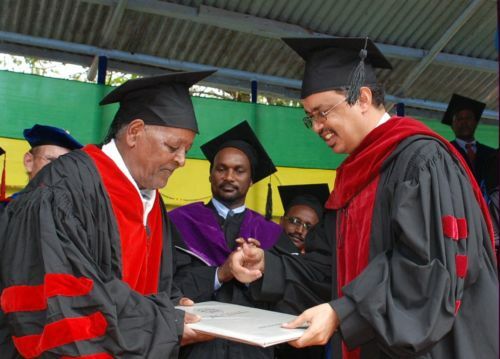 Renowned Oromigna singer Ali Birra received an honorary doctorate of music degree from Jimma University.The honorary degree represents the highest award from Jimma University. 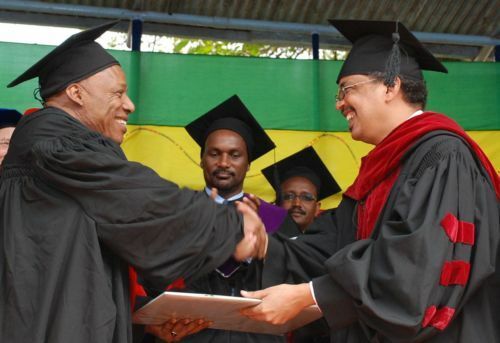 Minister of Health of Ethiopia, Dr. Tewdros Adhanom presented the degree to the singer at commencement ceremony on Saturday June 12, 2010. On rare occasions, the Jimma University Board of Trustees authorizes the awarding of honorary degrees to individuals who have led lives of distinguished service and professional achievement. Ali is praised as one of the premiere artists of his generation, dominating the national Oromo music scene.Ali flew to Ethiopia last Thursday from Canada where he is currently based. Jimma University also conferred an honorary degree to the village chairman of Awra Amba and philosopher, Zumra Nuru. Awra Amba is a village near Bahr Dar founded in 1985 by chief Zumra and other 20 people to demonstrate to its members and to other Ethiopians that the best escape route from poverty and hunger is not religion or prayer but education and plain hard work.This isolated community, which now consists of about 100 families, prides itself on an egalitarian non-sexist,(the weaving work is shared between men and women)and non-racist policy. The university has recognized Zumra Nuru for his contribution in founding an Awra Amba community and for his contribution in creating betterment in the lives of the community and for his progressive thinking to bring palpable change in the life of the community at grass root level. Page 5 of this article talked about awarding an honorary degree to Zumra! i would like to thank Jimma University ,the president Dr.Kaba urgessa with the whole management for they did something historical which made us all Oromos and all music lovers really happy. Ali Birraa remains a living legend in the history of Oromo arts and culture. He has always remained an idol inspiring innumerable young Oromos. God has endowed him with unsurpassed talent and Ali has always magnanimously gave it many. He deserves the honor. Equally, thanks to Jimma University for picking on an individual that similar higher institutions never, ever thought of. It is a break in tradition indeed. We all know who, for eternity, have always basked in the sun of endless and great exaltation and idolization. Wowowowowowowo what wonderful award to our legendary Dr. Ali Birra. You really really deserve. This is the moment we have been waiting for the most talented Oromo singer ever. Many thanks Jimma University for this amazing honour for Dr. Ali…………..
Ali Birra really deserves for that honorary degree and more. We as Oromo people are very proud of him and everything he did for our people and country. He is our legendary father. And iam persoanlly very very proud of him. Long live the legend! Ali Birra honorary doctorate of music degree from Jimma University is unnecessary event. He deserves the honor. Equally, thanks to Jimma University for picking on an individual that similar higher institutions never, ever thought of. because haramaya university was unable to do this yet ali was born in dirre dawa , a town nearer to harar than jimma and a place where ali demostrated much of his ebullient work. Ali Birra the legend who defeated his Aodiance”s heart buy music both contemporary and traditional.and Zumra Nuru who defeated poverty with his co_founder of Awra_ Amba community by his creative mind and philosophy not religion .I appriciated Jimma University for thier wise Dicission as well as Recognition Ali’s Effort and zumra’s sucess full stragel. your songs are nice! you appreciate nature, people, culture, ……………..
very few “musicians” play the guitar, ……. Images that Matter Rebel with or without a cause?